On Tuesday 22nd November, East Coast TKD along with ITF Eireann travelled to Rome, Italy to compete in the ITF World Championships. This was a 4 day event beginning on Thursday 24th July and ending on Sunday 27th July. 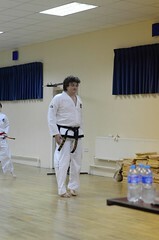 Mr McCabe entered the Senior Welterweight (-70 kgs) with a group of 12 very capable fighters. 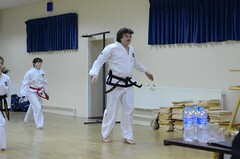 With the Senior Section being for 36yrs & Over, Mr McCabe, at 46, is sparring fighters sometimes 10 years his junior. He sparred in 2×2 minute rounds against two exceptionally tough fighters to enter the final in which he fought a man from Argentina, the country who for the most part dominated the World Championships with their skill showing in all aspects of ITF Taekwondo. After 2×2 minutes of battling, East Coast’s own Mr Chris McCabe was named the victor and was also named World Senior ITF World Champion. After also becoming Senior ITF European Champion the year before this makes him a current double title holder entering the European Championships next year. We are very proud to call him one of our Head Instructors and are looking forward to see what the future holds. On Saturday, 5th April, two East Coast students traveled to the ITA Dublin Open International held in the National Basketball Arena, Tallaght, Co Dublin. Both students performed exceptionally with Emmett Burke coming home with a Silver in Patterns and a Gold in Destruction and Alex Connolly receiving a Gold in Patterns. This competition is known to be extremely tough so a huge well done to both boys on their success. On Saturday, 2nd of November, East Coast Taekwondo travelled to the Roadstone Sports and Leisure Centre in Dublin to compete in the Dublin Open held by Mr Jim Falkner, V.
East Coast had 8 Competitors, all juniors, and all performed excellently as usual. First up of the morning was Leanne Hannon who won Gold in Patterns after doing a Chon Ji well deserving of her Gold Medal. Killian Hannon and Gavin Caffrey each did themselves proud in their patterns with Killian getting bronze against some tough competition. Josh Quigley, Emmet Burke and Alex Connolly flew the flag for the black belts with Josh taking bronze and Alex easily taking the Gold in the division. Jamiee Lee Davies did an exceptional pattern but sadly lost out on a medal while Daniel Fitzpatrick took the Silver in his Pattern Division. Next up was the sparring which is never a worry for any of the East Coast Juniors, each competitor easily proved their worth against their opponents. 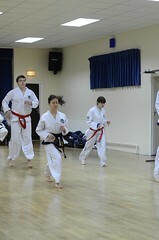 Leanne Hannon took home bronze, an excellent achievement for a white belt. 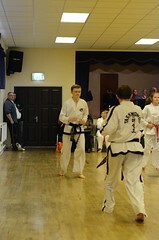 Gavin Caffrey also took bronze in his division. Emmet Burke had a battle on his hands against an extremely capable fighter and unfortunately the decision did not go his way. Josh Quigley, who was in the same division earned himself a place in the final but just lost out on the gold after a very close fight, taking the silver instead. 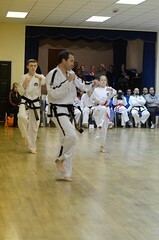 And Alex Connolly performed excellently against two very capable fighters, taking another Gold home. 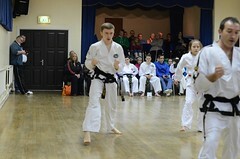 All round it was a great day and a huge well done to all the students who competed each one did their club proud. A special thanks to Mr Falkner for a great event and hopefully see you again next year. On Saturday, 26th of October, 7 East Coast students graded for various black belt degrees under Master Robert Wheatley, the grading took place at 10 AM Saturday morning under a panel that included 3 Masters of Taekwondo, each student did their instructors extremely proud and performed to their best ability each earning the degree they applied for. It was a special day all round but especially for the black tips, Jessica Bass, Jamielee Davies and Ian Kelly who became Black Belts for the first time. 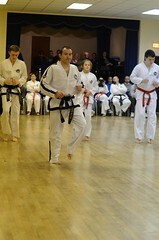 All three students performed exceptionally well and their Black Belts were well deserved. 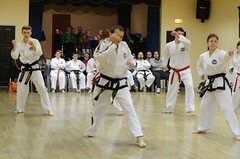 Josh Quigley and Dave Bowman earned their Second Degree Black Belts, both impressive all round after months of hard work. 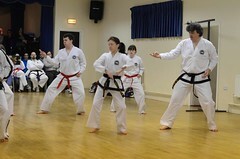 Rachel McDonnell got her 4th Degree Black Belt and also performed very well. And of course one of our head instructors, Mr Chris McCabe, got his 6th Degree Black Belt after an exceptional performance which showed his students and onlookers his excellent ability in Taekwondo. A huge congratulations is needed for Mr McCabe on such a brilliant achievement. 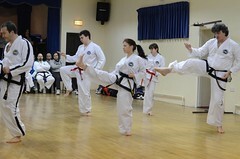 Congrats to all 7 students on completing such an important part of their Taekwondo journey. After the grading Master Wheatley held a seminar for all students of all grades and as usual it was a very enjoyable time and always brilliant to bring all clubs from ITF Eireann together. Well done to members of ITF Éireann including East Coast TaeKwon-do who did extremely well in the ITF European Championships in Barcelona with Ireland taking home 11 medals with 6 competitors. A Tae Kwon Do demonstration by East Coast Tae Kwon Do Club was held on Saturday 1st June 2013 at East Glendalough School, Wicklow Town. Thanks to all those students who took part. Videos can be seen on our youtube page.